"The black brethren of the Petermanns, the Eumos tribe, came in to share his camp with him". The above quote from Hell's Airport refers to Lasseter's encampment on the Hull River after his camels bolted in late December 1930, however the Aboriginal tribe that 'shared' Lasseter's camp were the Pitjantjatjara and not the Eumos. The Eumos people, correctly known as the Jumu or Yumu, inhabited the Western MacDonnell and Ehrenberg Ranges including Illbilla waterhole, and it is quite possible that Rip van Winkle, or to give him his correct Aboriginal name, Ngapatjukurrpa, was an elder of the remanent of the tribe. Norman Tindale, one of Australia's most erudite anthropologists of the era, recorded the unhappy fate of the Jumu, due to an epidemic, probably influenza, most of the tribe died out between 1932 and 1940 and the remainder moved east to Alice Springs and Hermannsburg, their lands, now abandoned, were taken over by the Pintubi and Ngalia tribes and these people may well have been Blakeley's 'Sandhill' men as he records meeting two distinctly different groups of Aboriginals at Illbilla in 1930. That Ngapatjukurrpa and his small family group were the original inhabitants of Illbilla is possibly confirmed by the cast off clothing they had inherited from the Mackay expedition based at Illbilla during May. When Blakeley's Sandhill men arrived at the C.A.G.E. camp in August, they were quite naked and unfamiliar with matches, metal containers and the strange ways of the Whitefellow. Given the number of Europeans camped in the vicinity of Illbilla during 1930 and 1931, Ngapatjukurrpa may have inherited more than cast off clothing and jam tins, the influenza virus may have been a deadly legacy of close contact with the city bred. These photographs were taken by Kingsley Love, the photographer and radio operator on the 1933 Mackay Expedition based at Docker River in the Petermann Ranges. Bob Buck was responsible for setting up the Expeditions camps and Love spent some time travelling with Buck who took the opportunity to perpetrate yet another tall story, on this occasion embedding the myth that Lasseter was carried by the Aboriginal woman for 30 miles. 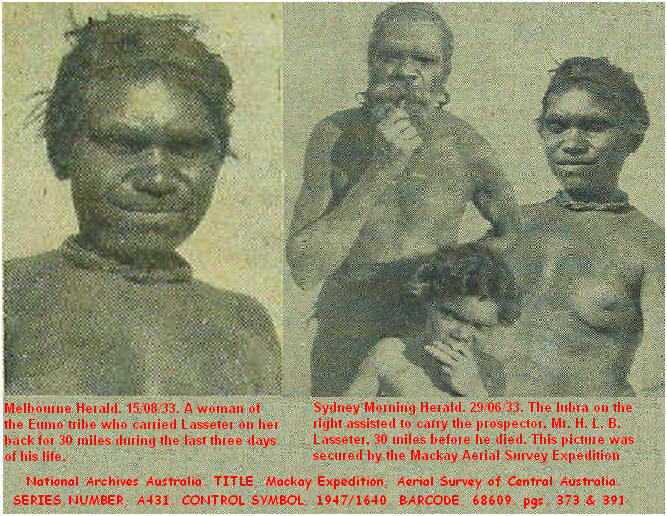 Several of Love's photographs appear in Hell's Airport and Coote also repeats the story and the misspelling or misinterpretation of the tribal name which seems to have began with the 1930 Mackay expedition when based at Illbilla. Coote, E. H. Hell's Airport, 132,156,157,248, National Archives Australia. TITLE, Mackay Expedition Aerial Survey of Central Australia. SERIES NUMBER, A431. CONTROL SYMBOL, 1947/1640. BARCODE, 68609. pages 373 & 391.